This outfit combination has stirred around in my head for months now, ever since I saw Kendi do a similar outfit. I've had this cardigan for about a year now, and it's been a hard piece to style because it's about two sizes too big for me and it's quite swingy on me (note: don't buy things on super-secret-final sale unless you're totally sure about the fit!). Here's how the cardigan looks on the model. So I finally came up with the idea of buttoning the buttonholes back to the buttons on the same side so the cardigan looks a little smaller. What are some pattern combinations you're interested in trying/have tried? Cute little glasses hunnie...love the striped cardi too...great mixing!! Um, this outfit just makes me want to squeal, "YAY!" Love all of it, especially the glasses. I'm not a big florals fan on myself, but I'm kind of on the lookout for abstract prints that evoke it. Love them paired with chunky stripes. LOVE. 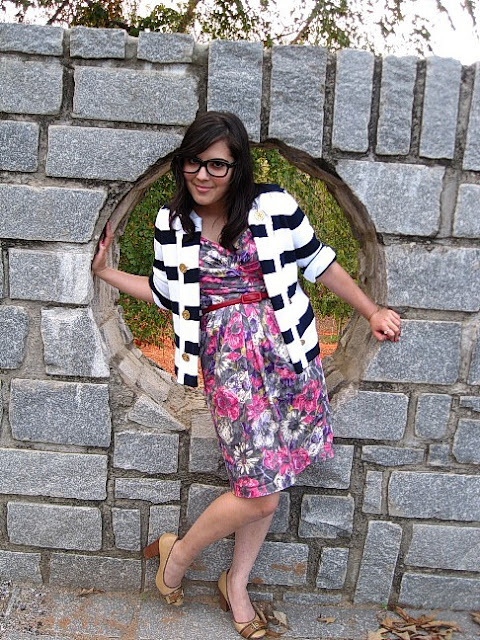 The stripes, florals, and the amazing nerd glasses are too adorable. I love fake glasses and am always on the lookout, but sadly, my tiny face makes finding anything that fits difficult. I envy anyone with the courage to pull off print-combos. I'm normally a very adventures soul but when it comes to prints I keep them very separate. Today I wanted to do a pink and brown printed patchwork skirt with a pink floral print hoodie, couldn't do it. Although, I did think, "This might be fashion forward, or it might be dorky." I always try to combine mixed prints and they never look right, but you look fabulous in this look. 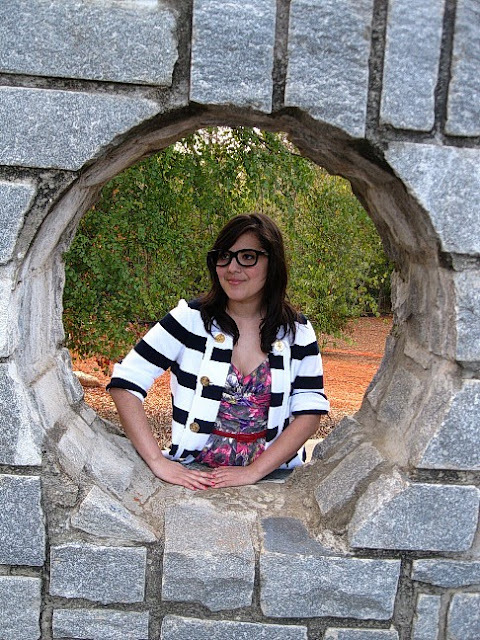 I too have a slight obsession with oversized nerdy glasses - I have yet to try them! What a great idea to make your cardigan smaller! It's genius! Love your outfit, I'm dying to try stripes with florals too! Love it! the photos by that circular window are amazing! okay they may be 3-D, but those glasses are so ridiculously cute i nearly squealed when i opened the page. Any print mixed with stripes is a go in my book! 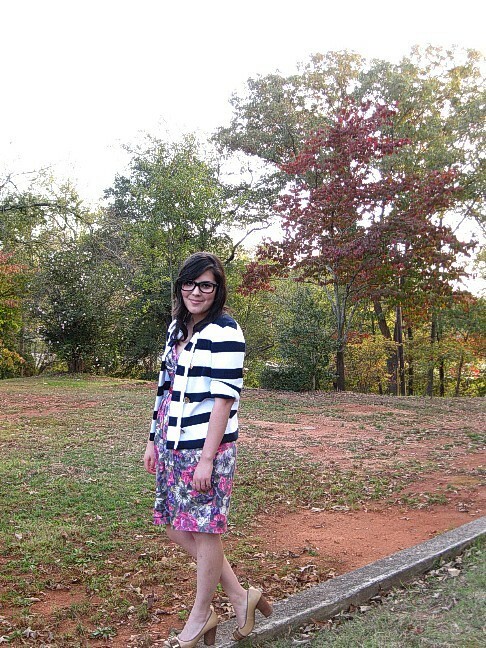 I love mixing florals and stripes, or polka dots with stripes. This combo looks great, and as always, you have great photographs!! These photos are so fun!! 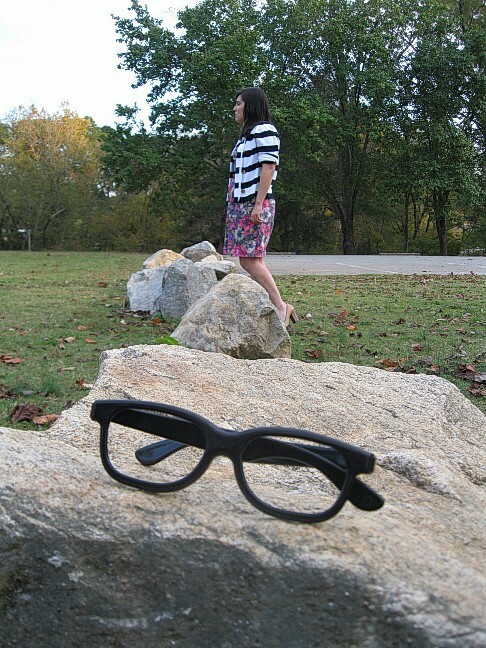 Love the location and I totally lol'ed when I saw you were wearing 3D glasses - delightful! This is such a perfectly inspired outfit! I love the pattern mixing and your "nerd glasses!" You're so flippin' cute, JoAnn! I like the stripes and florals together. I just haven't had the courage to try it yet. what a clever idea to button the buttonholes on the buttons. This is so cute! I like the way you mixed the print with the stripe and rigged the cardi. Plus the nerd glasses are charming! Um, I definitely wanted to see where the glasses were from! :) Love the whole look. This is a great way to make a too-large item work for you. And I think your mix of stripes and florals is perfect. I have been thinking of pairing stripes and polka dots myself, and am anxious to try it. And perhaps some plaid and floral -- if I can muster up the guts! i love stripes! great cardi...looks great with the florals.